I’m not familiar with these Lava Cake Kisses Valentine’s Day Specialties, but they sound chocolatey and delicious. The chocolate cake image and chocolate brown package highlights communicate in an instant what this is, beyond the creative name. Look close to see that Hershey’s Kisses is the sponsor and the ingredient. Package of 18, though one large heart-shaped cake would be a delight too. A Mated clear plastic tray insures upright presentation. 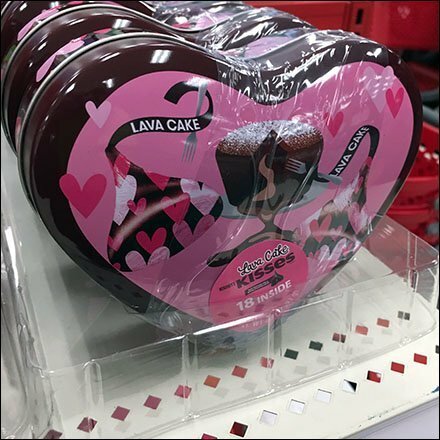 These Lava Cake Kisses Valentine’s Day Specialties seen at Target.